Pan De Oro Tortilla Chips > Noteworthy > Great Article on Spicy Foods from the Wall Street Journal! 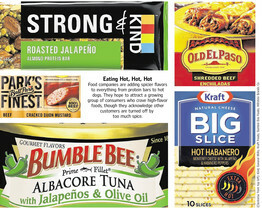 Chipotle and jalapeno are among the spicy notes showing up in prepackaged foods from tuna fish to snack bars. What’s behind the trend for spicier flavors? WSJ’s Sarah Nassauer reports on Lunch Break. Photo: Getty. Where there’s spice, there’s a loyal shopper. New understanding about how people who love spicy foods eat—and shop—is fueling the latest wave in making packaged foods hotter. “You get endorphins when you eat something really spicy,” which feels adventurous to flavor-seeking eaters, says Krista Lorio, senior manager of consumer insights forGeneral Mills Inc., GIS +0.40% which owns Cheerios, Betty Crocker and other brands. That experience can “create a lot of loyalty,” she says. The company recently started selling Helper Bold, a version of its boxed line of pasta that comes in Firehouse Chili Macaroni and other flavors. Spicy food can act as a badge of authenticity for some people, which also makes them loyal, say food companies. People who crave bold flavors are a growing and varied group, mostly made up of young, Hispanic, and older shoppers because taste buds dull as one ages, companies say. Even common, relatively bland foods are getting a spice injection. Bumble Bee recently started selling canned tuna with chipotle or jalapeños. Kraft sliced cheese is spiked with habanero peppers. The secret to making spicy food widely appealing is to balance the other flavors in the dish, a complicated task for companies’ food scientists. If “the salt or sugar or spice is too high, it’s going to immediately turn them off no matter how much they like chipotle or habanero,” says Jonathan Griebel, a senior scientist and chef at General Mills who worked on the recipes for new Old El Paso frozen meals for the company. “The first element is aroma,” says Amanda Zimlich, culinary director for Hillshire Brands Co., which has recently started selling several products with intense spices like Cracked Dijon Mustard Ball Park hot dogs. Then, people should taste “rich clean” protein, followed by enough spice that “it makes you salivate and you want more,” says Ms. Zimlich. Finally, “finish with a little bit of acid,” like lime juice or vinegar, she says. “You want to think about that whole process of chew, chew, swallow, and take another bite,” says Ms. Zimlich. Any imbalance during that time could make the spice taste overwhelming, she says. Kraft redesigned the packaging of its line of spicy cheese to include a “heat scale.” Five chili peppers show the level of spice from mild (Smoky Chipotle) to extra hot (Hot Habañero). The company is considering adding ghost pepper, known as one of the world’s spiciest, to fill in the fifth pepper on the scale, says Ms. Hjorth. While also intended to guide shoppers to their preferred spice level, it would “be a dream” if people bragged “I ate the 4 pepper” slice, she says. In the last year Kraft has started selling Oscar Mayer Jalapeño hot dogs, Chipotle Philadelphia Cream Cheese spread, and Jalapeño Deluxe Macaroni & Cheese. Kind, a company that makes mostly sweet fruit and nut bars and other snacks sold in eye-catching translucent packages, recently started selling spicy protein bars in flavors like Roasted Jalapeño and Thai Sweet Chili. The company hopes to grab the attention of young males who love spicy snacks, says Katie Nahoum, senior brand manager for the New York company. Still, there is “a lot of trepidation among consumers to try a savory snack as a bar,” says Ms. Nahoum. The company added a “spice meter” to packaging to help customers understand that the bars aren’t sweet and the heat level of each flavor. Packaged-food manufactures are following in the footsteps of restaurants in promoting the power of spice. 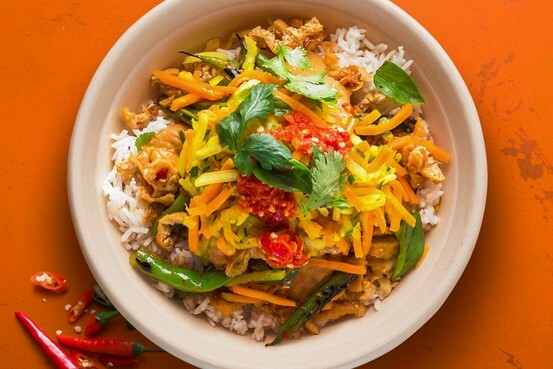 ShopHouse Southeast Asian Kitchen, a six-location chain of Asian eateries owned by Chipotle Mexican Grill Inc., has often received complaints about its food being too spicy, says brand director Tim Wildin. But the growing chain, where diners choose ingredients for Southeast Asian style rice, noodle or salad bowls in the same way they would for a burrito at Chipotle, has no plans to dull its flavors, says Mr. Wildin. “I think the moment you try to please everybody you are going to please nobody,” he says.